Revere F. Wistehuff was part of the group of cover artists in the New Rochelle Art Colony during the 1920's through the 1940's. Most notable among his peers were brothers, J.C. and F.X. Leyendecker, Walter Beach Humphrey, and Norman Rockwell. He was among the most popular illustrators of his time, and he had a good friendship with Norman Rockwell. His illustrations often told a story based on "americana", and his style of painting was similar to that of Norman Rockwell. His illustrations graced the covers of America's most popular magazines of the time, including The Saturday Evening Post, Liberty, Collier's, Life Magazine, Vanity Fair, and This Week, as well as many other secondary magazines. Wistehuff also created advertising images for John Hancock Life Insurance, Prudential Insurance Company, Gulf Oil Company, and Beck's Beer, in addition to doing illustrations for children's books. 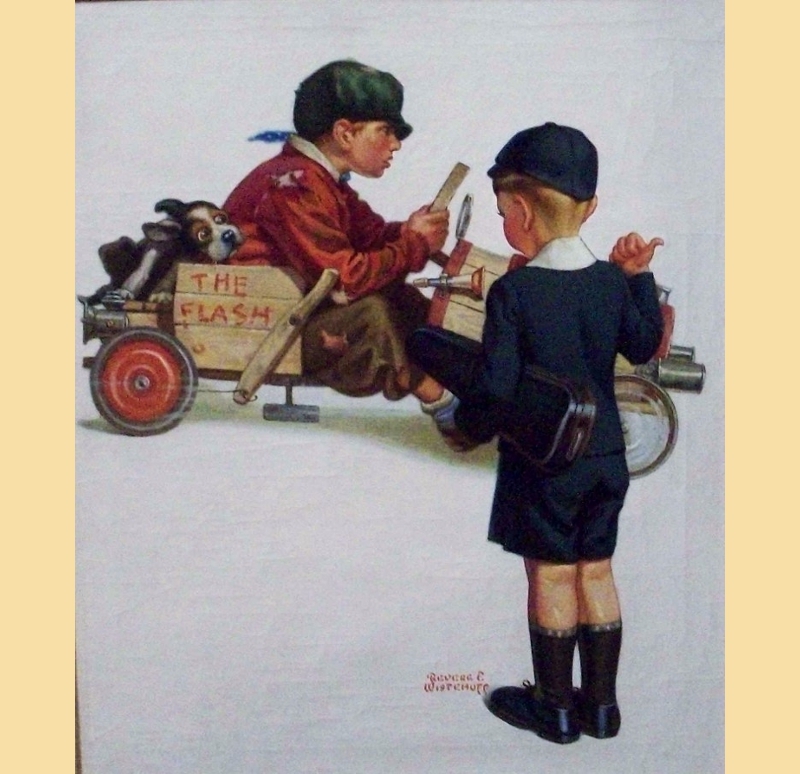 This Revere F. Wistehuff oil on canvas painting seems to tell a story of the well to do young man carrying his musical instrument, as he tries to hitch a ride on the less fortunate boy's handmade car, hoping to have a glimpse of some real fun. Wistehuff's style was similar to that of his good friend and peer, Norman Rockwell. Wistehuff's paintings depicted what was going on in America at the time. This painting was most likely done in the late 1920's and is a great example of his work.